One of the finer old buildings in Winnipeg’s North End is McGregor Armoury, at the corner of McGregor Street and Machray Avenue. It was originally designated the North Winnipeg Drill Hall and designed in 1913 by Winnipeg Architect H.E. Matthews, based an a standard plan (Type D Alternate with towers) from the Department of Militia and Defence. 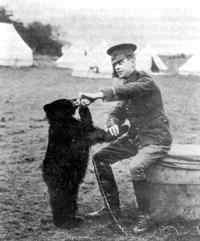 Just prior to the Great War, Canada’s citizen army was being expanded under the direction of Sam Hughes, Minister of Militia. The old wooden Drill Hall on Broadway Ave had proved too small to handle the expanding regiments and the two new Drill Halls, later to be named Minto and McGregor Armouries, were designed to fill the need. The original plans give us some insight into the lives of Canada’s citizen soldiers before the Great War. The building contained separate bowling alleys in the basement for Officers and Men as well as separate shooting galleries for each. Men’s, Officers and Sergeant’s messes were provided, complete with kitchens. A large space on the third floor was available for social occasions. The remainder of the building was divided into classrooms, office space and stores. The building is constructed of local yellow brick with a metal frame. The plan is rectangular, with 3 storey blocks at the East and West ends. The corners are built up into square towers with tyndall stone window sills and decorative brickwork. The original main entrance on the East side has a balcony over a double-door breezeway leading up into the main drill floor. North and South sides have rows of 13 foot high arched windows that flood the building with light. The interior, now painted beige, with a blue and gold striped pattern, was originally of yellow brick with bands of dark brown around the walls and windows. There are stairways in each corner and internal balconies on the second floor East and West sides overlooking the drill floor. All internal doors are of heavy oak slats with high oak baseboards and picture rails in the rooms. Though many of the fittings have been upgraded over the years, there are still marble washroom stalls and decorative iron and brickwork typical of the period. The first unit to use the building was the 106th Winnipeg Light Infantry. At the beginning of the War in August 1914, many of the WLI men had joined the 10th Battalion, Canadian Expeditionary Force, one of the Canadian Regiments who managed to hold the line during the first poison gas attack at Ypres in 1915. During the War, the building was used to house and train recruits for overseas service as well as operating the School of Bayonet Fighting and Physical Training. Small dents in the main floor still show where the bayonet dummies were tied down at the west end of the building. After the war, the WLI continued to train in the building, and it was also used by the local community. During the boom years of the 1920’s, adjacent Ralph Brown School became overcrowded, and classes were held in the Armoury. The North Winnipeg Churches Basketball League and the Winnipeg Light Infantry Cadet Corps also made use of the building. At the beginning of the Second World War, the Armoury became a recruiting centre and was transformed into a barracks overnight with tents pitched in the North field to handle the rush of volunteers. 17 and 19 Batteries, Royal Canadian Artillery, used the building as their home depot throughout the War. Many men from the North End got their first taste of Army life here. After the War, the WLI returned from active duty and the building continued to support the Regiment and the community as a place for bingo, dances and other social activities. In 1955, the Canadian Militia was restructured and the WLI was amalgamated with the Royal Winnipeg Rifles based at Minto Armoury. The building was then occupied by the 6th Column, Royal Canadian Army Service Corps, the 13 Provost Company and the Canadian Women’s Army Corps. In 1965, after another Militia re-structure, a new unit took over the building. Winnipeg’s own Cavalry Regiment, The Fort Garry Horse, rolled their Sherman tanks into the vehicle compound on a freezing January day and made the building their home. The Garrys had been formed in Winnipeg as the 34th Regiment of Cavalry in 1912 and served as a unit of the Canadian Cavalry Brigade in the Great War. Their exploits won a Victoria Cross for Lt. Harcus Strachan at the Battle of Cambrai on November 20th 1917, a date which the Regiment still celebrates every year with a Church Parade, dinner and dance. Still training on horseback until the beginning of the Second World War in 1939, the Garrys were converted to an Armoured Regiment, being among the first to land on the Normandy beaches on D- Day, 6th June 1944, and fighting through France, Belgium, The Netherlands and into Germany by war’s end in May 1945. The Garrys have kept the old Armoury well in the last 39 years. The Regimental colours of blue and gold are painted on the interior walls and stairways, Flags of Canada and the Provinces hang from the ceiling beams and panels depicting the Regiment’s Battle Honours, Cap badges of other armoured units, and a verse about the Regiment’s badge are mounted on the walls. In November 1995, a new panel, listing the names of all Garrys who have died on active service in two world wars and in peacetime, was unveiled. This is now a designated war memorial and is saluted by all uniformed personnel as they pass by. McGregor Armoury continues to provide valuable service to the North End community as well as the Military. Two Air Cadet Squadrons, numbers 6 and 573, operate out of the building, as well as the 1226 Fort Garry Horse Army Cadets. Outstanding youth organisations, the Cadets train young people ages 12-19 in citizenship, leadership, discipline, self reliance and physical fitness and many other skills. The old Armoury hums with activity every evening of the week and full days on weekends as well. Other organisations, notably the Royal Canadian Legion, use the parade floor to practice their fine colour parties, who proudly carry the flags and colours in parades. The parade floor has been used for everything from flea markets to archery competitions. The Messes continue their important social functions and the classrooms are used to train the Reservists of the Fort Garry Horse and the Cadets. On the third floor West side of the building, the former caretaker’s apartment now houses the Fort Garry Horse Museum and Archives. This Museum tells the history of the Regiment from its inception in 1912 to the present through display of photographs, artefacts and archival materials. An extensive archives is available to researchers of military history and those seeking information about relatives who served in the Regiment. The Museum is open to the public on Tuesday evenings from 7:30 to 10:00 and can be opened other times by appointment. There is no charge for admission. Phone 204-586-6298. McGregor Armoury continues to serve the city and especially the North End faithfully as it has for the last 81 years. Even the open space on the North side of the building is used by many in the neighbourhood for leisure activities. A Sherman tank and Lynx reconnaissance vehicle, set up as a memorial in the park, has been adopted by local children as a popular play structures. In 2003, the area was named Martin Park, in honour of LCol GJ Martin, Commanding Officer of the FGH, who was killed in a training accident in 1969. Members of the Regiment support local businesses and participate in community activities, particularly, Exercise Parcel Push, when the Unit’s vehicles and crews are used to assist the Christmas Cheer Board in delivering much needed Christmas Hampers.